This dirt-delivering stomper is a worthy and workmanlike first offering from a new name trying to establish itself in a crowded stompbox marketplace. We wish SSAudio luck! Great controlled response. Decent build and spec. Those looking for a volume boost won't find it here. 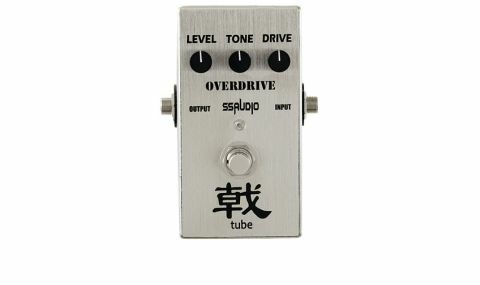 Here's a new Taiwanese company that has a small range of guitar effects pedals but, at the time of writing, no official UK distributor, which is something that the company is trying to remedy. In the meantime, it has sent us the Overdrive Gig pedal, sporting an attractive brushed silver finish - it's battery or adaptor-powered and boasts a bright-blue LED. "The Overdrive Gig is more polite than some 'drives"
The Overdrive Gig is more polite than some 'drives, with its tone knob offering a controlled response in the pertinent range. What you get is low-level transparent overdrive that sounds good into an already dirty amp, but users who like their overdrives to bump up the volume as well as add some dirt may find the level knob doesn't go far enough.